Size of Male: 65-80 lbs., 24-25 in. Size of Female: 55-65 lbs., 23-24 in. 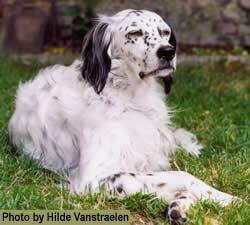 The English Setter is the oldest of the Setters and has been known since at least the 16th century. These dogs are friendly, mild-mannered and gentle. English Setters are very people-oriented and love children. They are an active breed but are relatively quiet in the home. They can excel in obedience, agility, rally, in hunting tests and as personal hunting dogs. They make an excellent family pet. The English Setter probably dates to the 13th or 14th century, when land spaniels began to diverge and become specialized. However, they are first mentioned as “setting dogges” in 1572. It seems that the setting behavior was already instinctive with the dogs then. Setters at that time crouched or “set” to indicate where birds were to be found. Before the use of guns they were used with nets and falcons when hunting. The English Setter as we know him today was developed by Edward Laverack in the early 19th century who bred his dogs for more than 35 years. Another important breeder of the time was Purcell Llewellyn who gave his name to a strain of English Setter hunting dogs based on Mr. Laverack’s breeding, mixed with other Setters. Today the English is still used in the field but his primary purpose is to be a companion. The English Setter is a friendly, gentle dog. He is considered calmer than his Irish Setter cousin and friendlier than the Gordon Setter. The English earned above average working/obedience intelligence ratings in Stanley Coren’s The Intelligence of Dogs , ranking 37th among all breeds. Dog training is relatively easy, although this dog breed can be willful and stubborn at times. They may pretend not to hear you if you tell them to do something they don’t want to do, but they won’t actually defy you. This sporting breed gets along very well with other dogs and pets, though they may occasionally want to play too roughly with cats. They should be well-socialized with cats and other small animals in the home from the time they are puppies. Any cat who is confident and able to put a dog in his place should have no trouble with these dogs. These sporting dogs are very active outdoors and they need plenty of exercise each day. If they don’t get enough exercise they can be destructive indoors. If they get enough exercise they are happy to be couch potatoes. This dog breed needs to be around people. They are devoted and very affectionate. They love to cuddle and want to be with you at all times. They love children. They can be chewers when they are young, as can many sporting dogs, but if you provide plenty of things for them to chew on this shouldn’t be a problem. This is just one way to stop dog chewing. This breed does not make a good guard dog. They are usually friendly to strangers. They may bark when someone approaches but they will likely welcome most people into your home with a wagging tail. Living Environment – The English Setter can make a good apartment dog if you provide plenty of exercise each day. They need to have a good run several times per week. If you allow them to run off-leash, make sure they are in a safe, enclosed area. Setters are inclined to run without considering that they might get lost. These dogs do not do well as kennel dogs. They need to be with people or they will be miserable. Grooming – Grooming for this dog breed isn’t difficult, but you do need to groom regularly. They have a long, silky coat that needs to be brushed and combed a couple of times per week to prevent matting and tangling. Do trim the hair around their paws and inside their ears regularly. This will keep them from tracking mud in the house and help prevent ear infections. Diet & Exercise – The English has normal dietary needs. Make sure you provide them with plenty of exercise. Some dogs are inclined to put on too much weight. They need lots of exercise to avoid developing common dog behavior problems. Health – This is a relatively healthy breed but they are prone to some dog health problems. Canine hip dysplasia and elbow dysplasia occur in the breed. The breed is also prone to canine hypothyroidism. Deafness occurs in the breed so make sure that any puppy you are interested in has been BAER tested for normal hearing. Puppies can be tested as young as 7 weeks. Dog allergies can occur in some dogs though these are probably related to thyroid issues. If you are interested in this dog breed you should talk to a breeder about dog health problems in the breed. The English Setter is a very intelligent dog but he is also mellow and laid back. These dogs don’t always exert themselves or reveal how intelligent they are until they steal the turkey off the dining room table. You will probably need to find ways to motivate your English Setter during dog training. Fortunately, most of these dogs are food-motivated. They are also very sensitive dogs so they don’t do well with any kind of harsh training methods. Use positive dog training methods with these dogs (praise, reward) and you should be able to achieve success. I have had 5 English Setters and would have no other breed. They are loyal and loving dogs and very friendly.